Yeah, pretty uninspiring title, I know. Hopefully, the content will be a little better. The main goals for the start of the year were to try to stick to the weights to keep the non-running related muscles in check and to start getting my average pace down a bit. 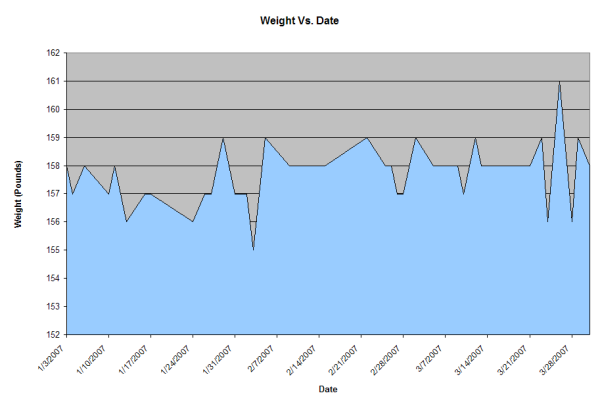 In respect to the weights goal, I’ve been doing pretty OK. I’ve been able to run the circuit twice most weeks. I have a hard time getting motivated about weights. I think its a toss up between getting a little less stress relief and the fact that weights are more challenging. Most of the time, I can complete a daily running session without much trouble. With weights, on the other hand, there are days where I can barely get through a single set on some machines. I like the routine of running the gamut of machines not concentrating on any particular area (otherwise known as a whole body work out, I guess). But, I think the benefits seem to be coming very slowly in my problem areas (chest and gut). Most of the other folks that at the alternate between different muscle groups daily. I’m not sure how well that would work with my two day a week plan. Have to do a little experimentation in that area, I guess. In terms of the other goal of speeding things up, I’m pretty pleased with some significant progress. The plan was to start working in some sprints in the mix. I started easy enough by sprinkling in some random quarter miles at about 75% of max speed. Based on my bodies previous experience (only sprinting the last bit of races), it was challenging to figure out how to slow down to a normal pace rather than stopping. After the first few runs with the new sprints, I was starting to feel more comfortable with both the speed sections and the rests in between. So, I started working in fast sections are regular intervals; a quarter every mile, a half every other mile, etc. I kept the opening and closing miles of my daily 7 at regular pace. Little by little, I worked my way up to speeding half each mile. Wow, I didn’t think I had that kinda of speed in me. I did notice that while I’m pretty comfortable during the run, it uses a lot more energy. I really feel it later in the day. On a whim, I tried sprinting on and off every quarter. At first, I thought it would be around the same as alternating halves, but it turns out to be a lot faster, because you don’t have as much time to slow down in during the breaks. 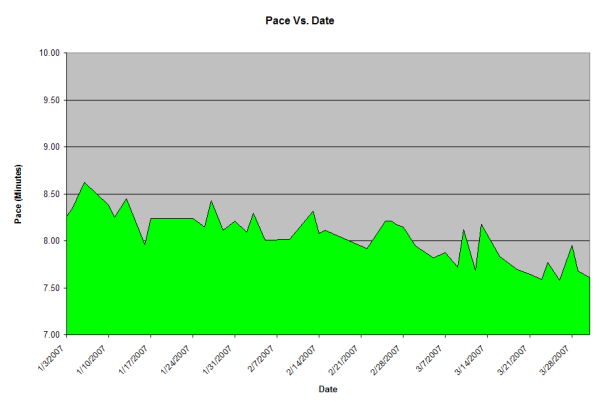 What would a running update be without pretty charts? Hmm, the weight part ain’t going so great. I don’t think I’ve been eating any more than usual or working out any less, but the pounds have crept up just a little bit. I think its something stress related. I’m not too worried about it yet, hopefully things will begin to even out again. I think this is the first time I’ve hit the ground running (pun intended) coming out of winter and not like I’m starting from square one again. I’m not sure if it was more consistency in work outs in the off season, or the lure of some decent spring race results that seemed to make me a little more motivated than I’ve been in the past. I’m basically pretty happy with where things are at. There were a few times when a work out got put on hold and ended up not making up the time; I feel kinda guilty about those, but have to realize that sometimes there just aren’t enough hours in the day. 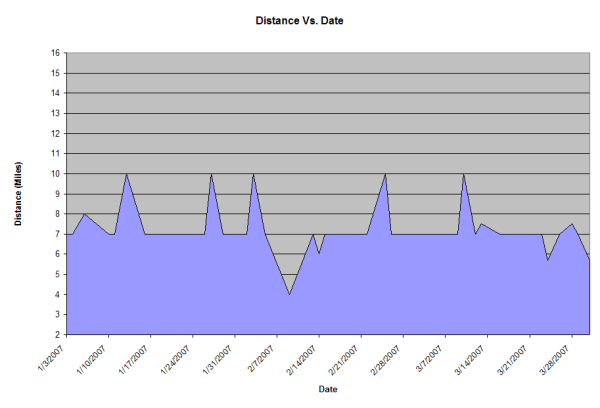 After a long stretch of major mileage indoors, I’m looking forward to more miles out of doors as the weather improves. I’ve already been teased out a few times after work and for the chilly Mountain Goat training runs. Next week 1st Marathon training starts. I’m pretty excited about that. Unfortunately, its gonna be a bit of a rocky start. I’ll be heading out of town for week for a conference, and right when I get back I’m having a little surgery (not running related, thankfully!) that will probably keep me off the road for another couple of weeks. Also sacrificed by the surgery will be the Mountain Goat. Man, that’s gonna hurt. After missing it last year due to the hernia, and hitting up the first few training runs already, I was really looking forward to the hills again. Hopefully, I’ll be back together for the other May races (Race for the Cure, Hall of Fame Half Marathon, F’ville 10K). Keeping fingers crossed!